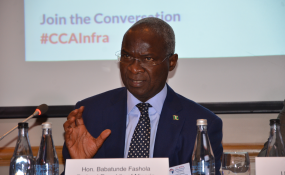 The Infrastructure Conference featured an ICT Plenary to discuss how broadband connectivity is reshaping Africa's ICT sector. Panelists included Charmaine Houvet, Public Policy Director Africa, Cisco South Africa; Pierre Guislain, Vice President, Private Sector, Infrastructure and Industrialization, African Development Bank; Mohale Ralebitso, CEO and Co-Founder, Ralco Investments and Yonas Maru, Managing Director, BCS Group; and Anu Sing, Executive Strategic Business Operations, MTN Group. The session, moderated by Kalidou Gadio, Co-Chair Africa and MENA Practice, Manatt, Phelps & Phillips, LLC emphasized the importance of connecting the continent and how technology will need to evolve to provide affordable and broad-reaching access. This can be achieved by taking a more nuanced approach by leveraging various technologies based on the market and region. Ms. Sing of MTN Group discussed the cost and reliability of satellite noting that it is becoming much more affordable. Given it does not require any wires, Satellite is ideal for more challenging and rural markets where broadband connection is not available. The Panelists also underscored the need for increased public-private collaboration and innovation. Mr. Guislain of African Development Bank noted that "the internet is global, and technology is global. Regulation is still national, and Africa has 54 markets that are not particularly well integrated." Mr. Guislain continued by offering solutions such as encouraging African governments to come together and adopt common regulatory frameworks on a regional level. This will create more opportunities for increased private sector engagement and investment in the industry.